Downtown Jackson is not only a place where many enjoy working, but it is also a place more and more people are calling home. From young professionals and growing families to retirees looking to engage in a new and exciting stage of life, an increasingly diverse community of people is choosing to make Downtown Jackson their home. The West Tennessee Farmers Market, The Amp, and many restaurants conveniently located within walking distance create opportunities for you to be a part of this great community. No matter the size of your family, apartments, lofts, and single family homes are available nearby in our downtown. 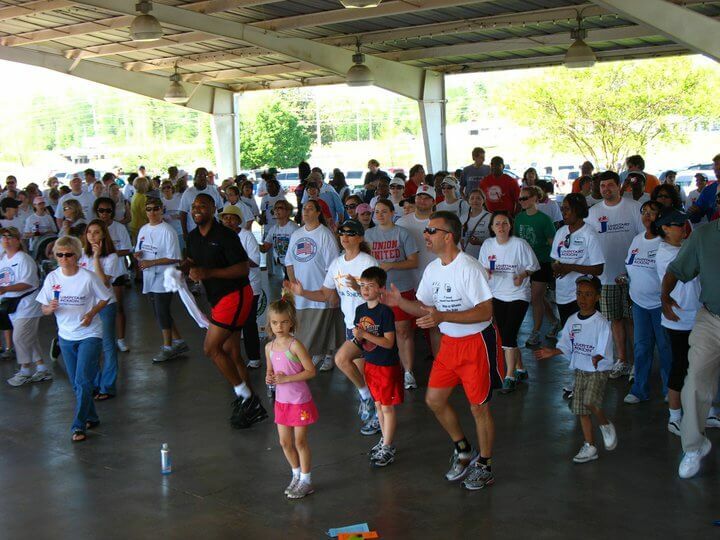 In an effort to combat obesity and promote community health and wellness, the City of Jackson and Jackson- Madison County School System will sponsor the 10th Annual Community Wellness Walk. Bring your walking shoes, the family and even your dog to take part! Free t-shirts will be given to the first 1,000 attendees and registration begins at 9:00 am and the walk begins at 10:00 am. "There’s no other place I would want to live than Downtown Jackson!" 2017 is shaping up to be a huge year for Downtown Jackson. With over $30 million in current development projects, there is much to be excited about! Phase II of Jackson Walk will focus exclusively on accommodating a continued tremendous residential growth, and theLOCAL will launch a previously vacant corner lot into a hub for small local businesses and community events. Work will begin on the South Fork Greenway connecting Downtown Jackson to Bemis with walking and biking trails as well as plentiful greenspace. 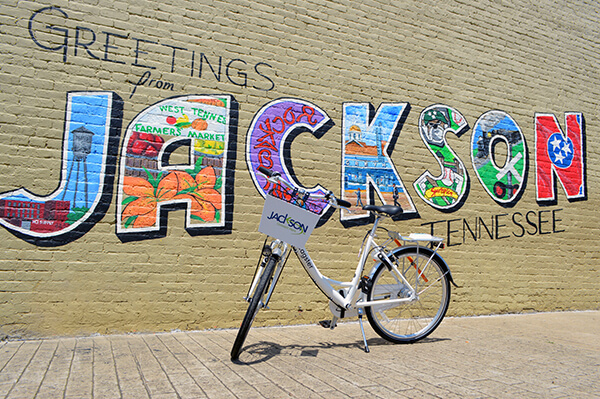 Nationally known company, Zagster, brings bikes on demand to Jackson. The soul of Jackson lives in our Downtown District. The Jackson Downtown Development Corporation (JDDC) works to enhance the quality of life in Jackson and the economic prospects of Jackson through the purposeful design, promotion and facilitation of strategic investment in its Downtown District. Our efforts drive economic development leading to the creation of a unique and vibrant Community which encourages people to live, work and visit Downtown Jackson. What do Native Americans, Davy Crocket, and Andrew Jackson have in common? They were all from right here, in downtown Jackson. Jackson, originally known as Alexandria prior to 1822, was founded in 1821. It was re-named in 1822 to Jackson, TN, to honor General Andrew Jackson who fought in the war of 1812. Jackson was booming during this time. When the Tennessee Supreme Court was established, Jackson was the biggest city in West Tennessee. In the 1970’s Jackson was transforming. With the construction of Interstate 40, it created a bypass to downtown, drawing people in. During the 80’s, Jackson was one of the fastest growing cities in the state of Tennessee. In the 90’s, at the direction of Mayor Farmer, a group of local business people, professionals, and government representatives came together for the purpose of making strategic recommendations for development and revitalization of downtown Jackson. This group of people was tasked with stimulating and marketing downtown economic development through organization, promotion, design, and economic restructuring. Over the past 35 years, the National Main Street Center has led the development of a national network of over 2,000 historic downtowns and neighborhood commercial districts: Main Street America™. Made up of small towns, mid-sized communities, and urban commercial districts, Main Street America™ represents the broad diversity that makes this country so unique. The Main Street movement grew out of a recognition that a community is only as strong as its core and in downtown Jackson, we believe the same. Our downtown has been accredited with Main Street America for over 25 years! Take Our Quarterly "Pulse Survey"
Downtown Jackson is West Tennessee’s destination for creative, unique, and local. Our upscale shops and plethora of diverse dining options create a scene rich with life. A hub of arts and culture, our high quality entertainment venues and other amenities make Downtown Jackson the place to be. Our sidewalk network ensures a safe and interesting walk and our greenspaces enhance pedestrian experience. Great burgers, great fries, great everything! Don’t leave without a milkshake, it’s the best in town. Located in the historic Neely House, Chandelier is Jackson&apos;s newest fine dining destination. Innovative southern cuisine in a comfortable, eclectic setting. Metropolitan food and service with warmth and charm! Winner of Readers&apos; Choice Best Fine Dining. Jackson and Madison County's only full-service, locally-owned and operated natural and organic market. In addition to groceries, Grubb’s also houses a full-service deli with made-to-order sandwiches and panini, "grab-n-go" prepared food items, as well as a soup and salad bar featuring a selection of fresh soups on rotation daily. Rock&apos;n Dough Pizza & Brew Co. The Rock&apos;n Dough food philosophy is "fresh and local." They make all dough and sauce daily, and shred their own cheese, smoke their own meat, and prep all their fresh veggies in-house. Rock’n Dough proudly supports local businesses and sources ingredients from local farms and local companies. The good vibes are always flowing at Woodstock, where the best cupcakes in town are just the beginning! You’ll also want to try their always interesting breakfast menu and the ever growing lunch&excl; Named Best Baked Goods and Best Dessert in the Readers&apos; Choice Awards. A unique lifestyle boutique and online store offering affordable, designer-selected clothing and accessories sourced in the fashion capitals for the fashion-obsessed. Euphoria Salon is a unique environment designed to ensure a pleasant and peaceful salon experience bringing the necessity of hair and nail services to a new level of indulgence. A full service jewelry store with a unique selection, King Jewelers is locally owned by Grover King who has 28 years’ experience as a certified jeweler. Polished Salon is founded on the idea that getting your nails done should be a lovely experience. They promote a healthy environment for employees and clients with no harmful odors or fumes associated with a nail salon. Pedicures come with liners and disposable files, buffers and pumice to assure a sanitized and safe experience. With three floors of goodies, The Vintage Market brought heart, soul, and lots of style to Downtown Jackson. Come down and shop for unique furniture, vintage and antiques, home decor, candles, art, clothing, and more. The Ned R. McWherter West Tennessee Cultural Arts Center is the place to see the finest musical and stage acts in an intimate, high-tech performance space. The Ned also houses two art galleries for traveling and local exhibits. "I wanted to be closer to all the things going on Downtown and I have not been disappointed&excl; I bought a house at Jackson Walk and have thoroughly enjoyed walking to the Amp concerts and the Farmers&apos; Market. There&apos;s no other place I would want to live than Downtown Jackson&excl;"
"Great neighbors…quiet evenings on the front porch…a quick walk to the Farmers’ Market…arts and music offered at a number of downtown venues — these are but a few of the things we enjoy as Jackson Walk homeowners. The scenery and security, along with the nearby Lift Wellness Center, foster a fitness lifestyle as well as the desire to walk to most everywhere we go." "Living in the Jackson Walk community has been transformational for me. As a kid born and raised in the country, I never thought I’d enjoy living &apos;in town.&apos; But my eyes have been opened to the benefits of living in a walkable, urban community. Jackson Walk has given me convenience, a healthy and vibrant lifestyle, and a sense of community that I’ve not experienced before. Great things are happening here, and it is exciting to be part of it&excl;"
"We were about to get married and wanted to build a home of our own. Downtown was the perfect choice for us. Centrally located between Clayton&apos;s business and my office, downtown is very convenient. Between the concerts at the Amp, trips to the Farmers market, plays at the Ned, and other special events, there is always something to do. When we moved downtown we were very excited about having anything we needed at our finger tips. We can walk to Grubbs Grocery, the Lift, great restaurants, and other shops. We have also made great new friends in the neighborhood. We are so glad that we chose to live downtown&excl;"
"We absolutely love living downtown. For us, it provides a strong feeling of community that we haven't experienced anywhere else. We are able to walk to dinner, the grocery store, the Farmer's Market or the amp — there's always something fun to do&excl; Especially on the weekends, the area just comes alive. If i were explaining it in one word, I'd choose &apos;vibrant.&apos; Downtown Jackson's story is developing and we couldn't imagine not being part of it. It's the heartbeat of our city and Jackson's best kept secret we can't help but share&excl;"
The South Fork Greenway is a rail to trail conversion project that begins in downtown Jackson adjacent to the Farmers Market and Jackson Walk development. This multi-use trail will travel south along an abandoned railway to ultimately connect with the Bemis community in South Jackson. This greenway will provide a scenic route with several miles traversing through the South Fork of the Forked Deer River floodplain. From beginning to end this signature greenway will contain approximately 3.5 miles of walking, running, and biking opportunities for residents. Flood reduction is also a point of emphasis with this project. Several small levees are to be constructed adjacent to the greenway in Bemis that will provide protection to homes that are prone to flooding. To aid with the flood reduction efforts of this project, a portion of the historic Bemis Mill dam will be reconstructed to help detain waters from Cane Creek and provide flood storage. Terrinopolis Foundation exists to enrich the life and culture of local neighborhoods through visionary playscape environments that foster child-like wonder. They are currently focused on developing a downtown playscape with structures created by the City Sculpture team from St. Louis’s City Museum. The playscape designs will be based on an open mythology created by a local man and his daughter, allowing people of all ages and backgrounds to re-create through play and imagination. theLOCAL is a micro-retail development and community space providing local entrepreneurs and artisans the opportunity to sell goods and develop their businesses in a low-overhead environment while connecting citizens through social programming. Originally Jackson High School, The Renaissance Building is now home to apartments, office space, as well as the famed Jackson Escape Rooms, with additional units to be converted to fully furnished executive suites in the coming year. Ravaged by the spring 2003 tornado, restoration began that fall and was completed early 2005. In addition to several floors of housing units, The New Southern boasts The Gold Room, an upscale banquet hall and ballroom, and is now home to Woodstock Bake Shop, Oz Used and Rare Books, and Express Printing, Signs, and Shipping. The New Southern Hotel won the preservation award from the Tennessee Preservation Trust in 2006 and appears on the National Registry of Historic Places. Originally an opera house, the Pythian Building now offers two floors of residential space and two floors of office space, with a grand banquet hall overlooking the town square. It is named for the Knights of Pythian who once occupied the third floor of the building. Once the Murphy Hotel, the Neely House is now home to local favorite Chandelier Café and Cater, recently awarded “Best Fine Dining in Jackson” in the 2017 Jackson Sun Readers’ Choice Awards. The second floor accommodates numerous office and studio spaces. The Neely House eon the preservation award from the Tennessee Preservation Trust in 2007 and appears on the National Registry of Historic Places. Built in 1959, and originally the education building for First Baptist Church, The Suites of Larue were in the process of being converted to residential space when the old sanctuary was destroyed by fire. Now home to 18 upscale apartments, the facility offers an entertainment area with full kitchen, as well as a lovely outdoor courtyard. Jackson Walk began by connecting West Tennessee Healthcare’s bold approach to wellness &lpar;Lift Wellness Center&rpar; to downtown Jackson. We are enjoying a surge of civic pride as we watch Jackson Walk become a landmark while it revitalizes an historic area. Jackson Walk creates a civic commons using a transformed Central Creek to link the Farmer’s Market, The Amp and the Dog Park. The new addition to Jackson Walk is growing so it will connect to another major asset, The University of Memphis​ &dash; Lambuth. This expansion will include 120 new apartments and ​40​ single-family townhomes. We see this all together creating the Tipping Point in Jackson’s rebuilding and reimaging itself. Payment options include Pay-As-You-Go with your first hour free, then $1 per hour to ride; Annual Membership of $20 and Student Annual Membership of $10, each offering 3 hours of free ride time. For more information about Zagster, go to zagster.com/jacksontn or download the free app on the App Store or Google Play. "Downtown Jackson is fill with amazing people, which correlates to a beautiful surrounding atmosphere. As a local business we have received so much support from the citizens of Jackson. We are truly bless to have been given an opportunity to start West Alley BBQ in downtown Jackson." "Being involved in the renaissance of downtown has been a wonderful experience. The beauty of it is this, downtown Jackson is rich in history, yet in its infancy as far as business and residential growth is concerned. This is a great time to be in the downtown area and be a part of shaping the future with a keen eye on the past." "We chose to be downtown so we could be the gathering place for everyone that works and lives in the area. We have received an overwhelming response to our food, beer and cocktails! The downtown Jackson community is GREAT and we couldn't have made a better choice when picking a location for our restaurant." "With the ongoing revitalization of downtown Jackson, this area is exactly where I wanted to open Grubb's Grocery. There's a growing energy and youthful vibrancy that the area brings that mirrors exactly what I envisioned the new store to be. As the area gains more attention from Jackson and the surrounding areas, this decision has proven to be the right one. I'm excited to see what the future holds for the new businesses and residents moving downtown." "The reason I chose downtown to start my business was the hometown feeling, 20 years later I still have that hometown feeling. Jackson is my home. Downtown is my home." "From our beginning, Jackson Escape Rooms wanted to honor our collective past and be a part of our shared future. That’s why we call downtown Jackson our home and are proud to be a part of what’s happening in the heart of our city&excl;"
"We took our dream and ran with it and we haven’t looked back! We believe in Jackson, TN and we especially believe in downtown&excl;"
The PILOT &lpar;Payment In Lieu Of Taxes&rpar; Program incentivizes the improvement of historic properties through tax abatement, typically for a period of ten &lpar;10&rpar; years. Property taxes are frozen at the currently assessed value, allowing the property owner to realize a significant savings of the abatement period. Participation in the PILOT program is contingent upon application and approval, and a fee equal to 1% of the anticipated final improvement value of the property is due at the start of the abatement period. Tax Increment Financing is available to subsidize redevelopment, infrastructure, and public improvement projects occurring in the Downtown district. Living Downtown has never been easier! With the additions of Jackson Walk Apartments, The Suites of Larue, dozens of historic lofts, and new home construction on the northern edge of the neighborhood, over 300 new housing units have been erected in Downtown, with over 150 more scheduled to be built over the next year. Downtown Jackson is West Tennessee's destination for unique dining options&excl; Food sales in Downtown Jackson have grown over 50% since 2014. Incredible value with unmatched character! Downtown Jackson offers an unrivaled value in historic buildings through ownership investment or leasing options. Downtown Jackson is a high traffic area&excl; The key to a great business is visibility and over 40,000 vehicles enter Downtown Jackson through various corridors. Community support&excl; The local community loves its Downtown restaurants and retail, businesses love locating Downtown for the amenities, and people love living downtown in close walkable proximity to everything. Rainey, Kizer, Reviere and Bell, P.L.C. Law Offices of Holmes, Rich & Sigler, P.C.